You’ll know from some of my posts that I recently visited Istanbul for the first time and fell in love with the place. The thing I loved the most was the way it embraced variety, with old and new, east and west, happily jostling along together, free to show their differences. Yet teh story is not as simple as that; Twitter was banned in Turkey on March 20, 2014. Presumably the government felt that liberty was too dangerous! Some have been able to circumvent the ban, and an Ankara court has ruled that the ban should be removed. The Turkish telecomms regulator has 30 days to appeal this ruling. For an interesting local view on this ban check out Aylin Alpustun’s post. Linked to Weekly Photo Challenge: Street Life and Six Word Saturday. Wonder capture, it goes beautifully with how you described the place. My favorite kind of place as well, combining the old with the new, and it’s a shame about twitter for Turkey, but your quote certainly speaks to that. Thank you for sharing Istanbul with us. 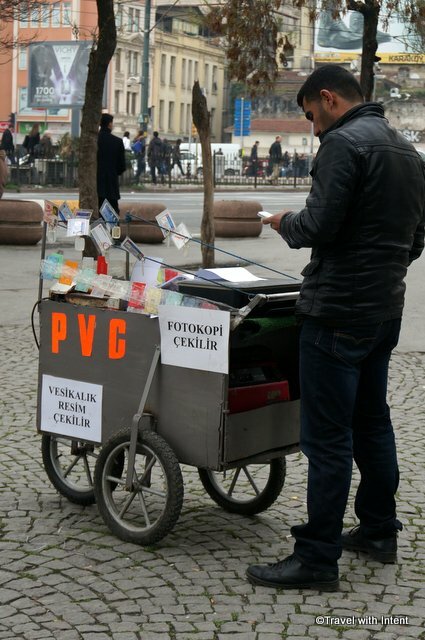 I’ve never heard of or seen a roadside copying stand–how interesting! very cool photo – and pretty crazy about the ban in tweeting….